upper canopy damage in lower elevations of the field. 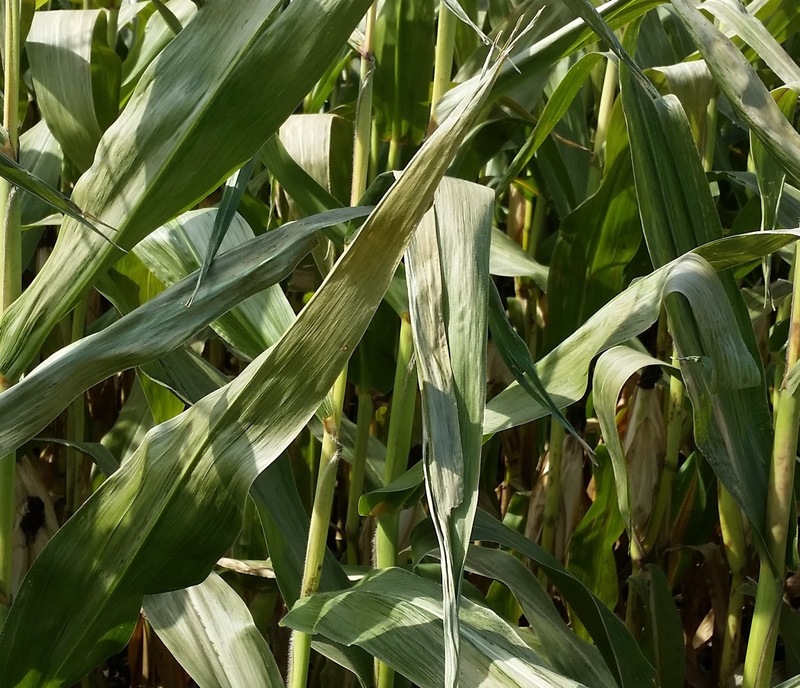 Corn leaves are more easily damaged by frost than stalks. In addition, leaves above the ears are more susceptible to injury than leaves below the ear. Leaves damaged by frost initially have a water-soaked appearance (Figure 2), are light green to gray after drying and later turn brown. It is recommended to wait a few days before scouting fields to assess the impact of frost. If the frost is not severe enough to cause premature formation of the kernel black layer, the kernels will continue to accumulate dry matter through translocation of sugars from the stalk and remaining green leaf area (Carter and Hesterman, 1990). Apart from climatic and topographic variation, soybean management and growth conditions greatly affect frost's damage. Dense and lush soybean canopies tend to fend off severe freezes by holding heat within the canopy, whereas, open canopies tend to allow the cold air access to the lower canopy (Figure 3). 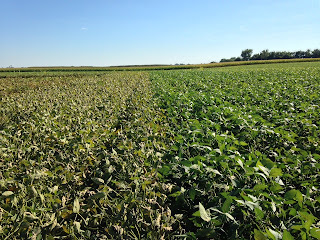 Late planting, soybean cyst nematode (SCN), iron deficiency chlorosis (IDC), and/or some conventional herbicides tended to promote open canopies this year in many areas. These fields were likely damaged more by the frost than less stressed fields. Likewise, soybeans nearing maturity tend to see deeper frost damage due to dropped leaves and open canopies. However, injury (in the form of reduced yields) is greatly reduced if frost hits as soybeans near the R7 growth stage (one mature colored pod on the main stem). Due to the variable nature of natural frost, yield loss estimates are quite difficult to come by. Yield and quality reductions depend on the crop stage when frost occurs and the severity of the frost. Frost damage reports varied in Minnesota from just a few soybean leaf trifoliates affected to frost damage of at least the top 6 inches or more in the upper portion of the canopy. Frost damage to corn reduces grain and silage yields, grain test weight, and silage quality (Table 1). If leaves above the ear are damaged by frost, but leaves below the ear are unharmed, then yield losses are expected to be slightly less than those listed in Table 1 for leaf damage only. Table 1. Impact of frost damage on corn yield and moisture. University of Minnesota conducted a series of trials in 2009 and 2010 estimating frost risk based on soybean maturity selection. You may find a summary of results here. Frost was simulated with Liberty® herbicide applications at a 32 oz. rate in early and late September on soybeans with a range of maturities. In addition, a late planting date was also included in 2009. Under normal planting dates, early and normal maturity soybeans were not affected by frost - even at early September frost dates. 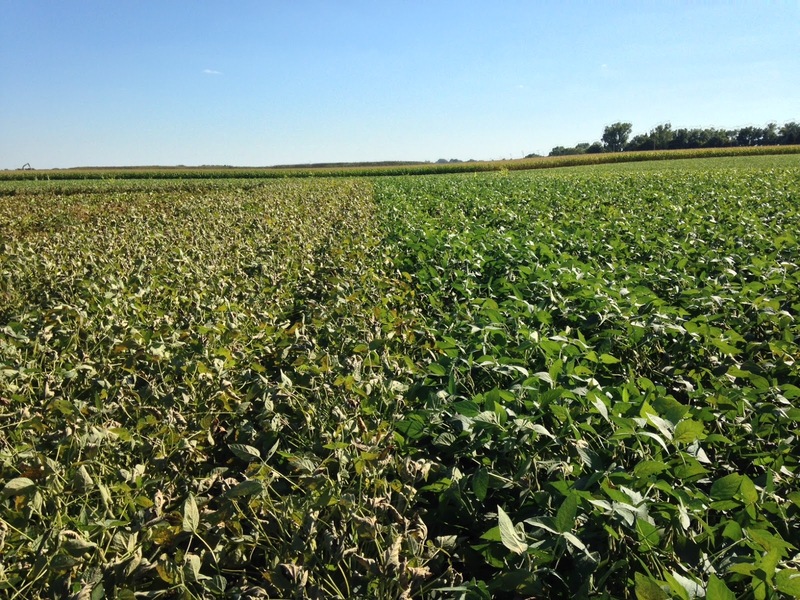 Very late maturing soybean varieties saw yields reduced by 15-30%. Late planting (around May 21) drastically increased risk of frost damage in both early and late varieties. These results highlight the large downside risk to planting full and long-season soybeans late in May, while choosing an early season soybean resulted in a small yield penalty in the absence of a terminal frost. Planting a very long-season variety late in May resulted in huge losses if a (rare) very early frost were to take down the crop. In this example, utilizing an adapted line throughout late May forges a nice balance between yield potential and risk aversion. The most often cited study on frost damage to soybean is Saliba et al., 1982. In this Kansas study, soybeans of varying maturity were grown in pots in the field and transported to growth chambers set to 32°F, where they remained until 80% of the leaves were visibly injured. Plants were returned to the field and yield was determined at the end of the season. As expected, yield data were a bit messy, but yield losses were estimated to be around 37% at R6 and 7% at R7. As one might expect, these yield losses closely follow those noted in defoliation studies. With the exception of late replants, most frosted fields in Minnesota were probably somewhere between R6 and R7 on Saturday. Unfortunately, the R6-R7 period is a time of rapid yield accrual in soybean. Damage will be dependent on the exact timing of the frost relative to development. Hard hit fields, or replanted areas that were close to R6 might see 30-40% yield reductions, whereas fields closer to R7 will only see minor effects. Fields with few yellow leaves showing prior to the frost will likely see significant yield loss, if a large portion of the canopy was damaged. Corn that is severely damaged by frost often has kernels that are more susceptible to cracking, grain that is less digestible, and silage that has less energy (starch) and more fiber than normal. Grain with severe frost damage and light test weight should be monitored for mycotoxins before feeding to livestock. Arresting soybean development late in seed fill tends to reduce yield by stopping oil deposition in the seed. Oftentimes, frost-damaged seed is small, flat, and green, with normal protein but low oil concentrations. Mixing severely frosted grain with normal grain has the potential to cause multiple complications for the producer from storage through marketing. Grain from damaged areas can resist field dry-down and can maintain excessive moisture levels through harvest. In addition, elevators may refuse loads with green soybean, or impose stiff dockages. Frost-damaged areas (especially late planted/drowned-out areas) should be isolated and harvested after the unaffected areas. While this can add logistical challenges to large operations, it could reduce risks of damaged grain in storage and will isolate potential dockages to individual loads rather than whole bins. Dr. Charles Hurburgh at Iowa State University has prepared a nice fact sheet related to handling frosted corn and soybean crops. Typical in-field dry-down rates for corn grain in Minnesota are listed in Table 2. Thus, if a killing freeze occurred on corn at the R5 stage (dent and 60% grain moisture) on September 15, then that corn is expected to have over 38% grain moisture on November 1. In comparison, if a killing freeze occurred on corn at the R5.5 stage (half milk and 40% grain moisture) on September 15, then that corn is expected to reach 25% grain moisture on October 6. 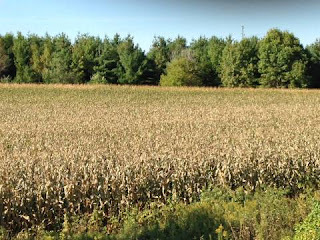 Fields where the husks were green and tightly wrapped around the ears at the time of a killing freeze will dry slowly, and ears in those fields should be monitored for mold. In contrast, corn that was more advanced in maturity at the time of the frost (husks opening up and turning brown) will dry more normally. Table 2. Field drying rates for corn in Minnesota. For more information, see Early fall frost and corn and Early fall frost and soybean. Visit University of Minnesota's Crop production website. Abendroth, L.J., R.W. Elmore, M.J. Boyer, and S.K. Marlay. 2011. Corn growth and development. PMR1009. Iowa State University. Carter, P.R., and O.B. Hesterman. 1990. Handling corn damaged by autumn frost. Available at http://www.baycounty-mi.gov/Docs/CitizenCorps/HandlingCornDamageByAutumnFrost.pdf. Purdue University. Hicks, D.R. 2004a. Corn test weight changes during drying. University of Minnesota. Hicks, D.R. 2004b. The corn crop - frost and maturity. University of Minnesota. Lauer, J. 2011. Frost. Available at http://corn.agronomy.wisc.edu/Management/L041.aspx. University of Wisconsin. Lauer, J. 1996. Corn harvest in Wisconsin during cool growing conditions. University of Wisconsin. Nielson, R.L. Risk of fall frost injury to immature corn grain. Available at http://www.agry.purdue.edu/ext/corn/news/articles.02/Grain_Maturation_Frost-0910.html. Purdue University. Vorst, J.V. 1990. Assessing hail damage to corn. Available at https://www.extension.purdue.edu/extmedia/nch/nch-1.html. Purdue University.